Day one of the conference was nothing short of amazing. More than 200 vendors showcased services, including products demonstrating virtual reality technology, block play, art, reading, and music. IEN TV, a prominent media outlet in Saudi Arabia, was present to document history in the making. They stopped by NAEYC’s booth to chat about the conference experience. The kingdom highlights different countries every year during this annual event. In 2011, the first-ever Taleem conference featured organizations from Singapore. In 2016, France was featured, and this year the United States was featured as the guest country. More than 80,000 people were in attendance; among these were delegates from the US Embassy, HighScope, Mile High Early Learning, Council for Professional Recognition, Erikson Institute, Ready Nation International, World Bank, National Head Start Association, KinderCare, Vanderbilt University, Educare Center, Consultants in Development, School Readiness Consulting, Children’s Museum of Denver, Global Partnerships for Education, and a host of other delegates from organizations throughout the United States, including NAEYC. NAEYC continues our integral work in the educational component of the vision. 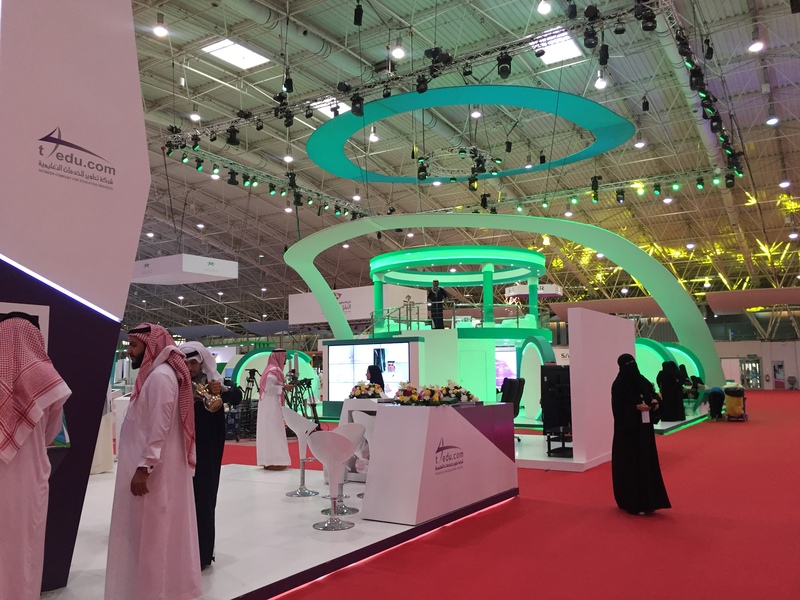 In partnership with T4edu, a Saudi Arabian government contractor, NAEYC offered technical assistance to help develop the Saudi Early Learning Standards (SELS) for children 3 through 6 years old. In 2017, NAEYC helped the kingdom publish implementation guides for those standards and recently developed an early learning curriculum and early learning standards for children ages birth to 3 years. The curriculum framework includes the philosophical and educational foundations and the individual, societal, and economic impacts that align with the indicators of child development detailed in the SELS. 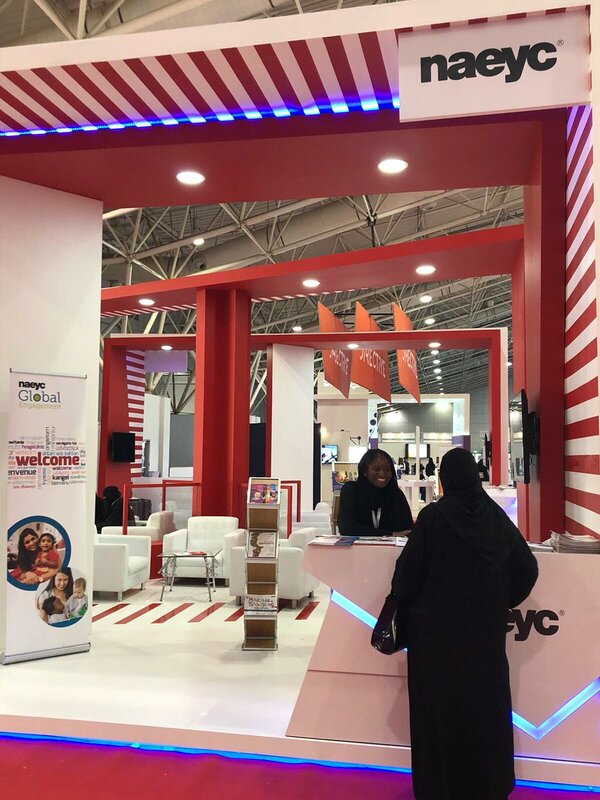 Taleem 2018 allowed NAEYC to introduce the association to professionals, experts, advocates, and early childhood education organizations in the kingdom and to the more than 25 other countries represented at the conference. During the weeklong conference, we made connections with conference attendees and shared the breadth of the work that NAEYC contributes to improve the profession both domestically and globally. Dozens of early childhood education practitioners gathered to gain insight from NAEYC’s Senior Director of Global Engagement, Stephanie Olmore, who spoke about developmentally appropriate practice. 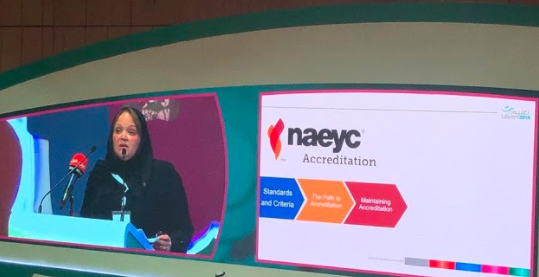 Olmore also participated in a panel discussion highlighting NAEYC’s code of ethics, along with various other early childhood education leaders from around the world. To help us understand the environments that their young children live in, our friends at T4edu lead all US participants on a tour of Riyadh to experience the city’s rich history and culture. First, the Najd Village Restaurant welcomed us for dinner. We left our shoes at the door and sat “criss-cross applesauce” on the floor of a traditional family-style dining area while enjoying authentic Saudi Arabian cuisine. 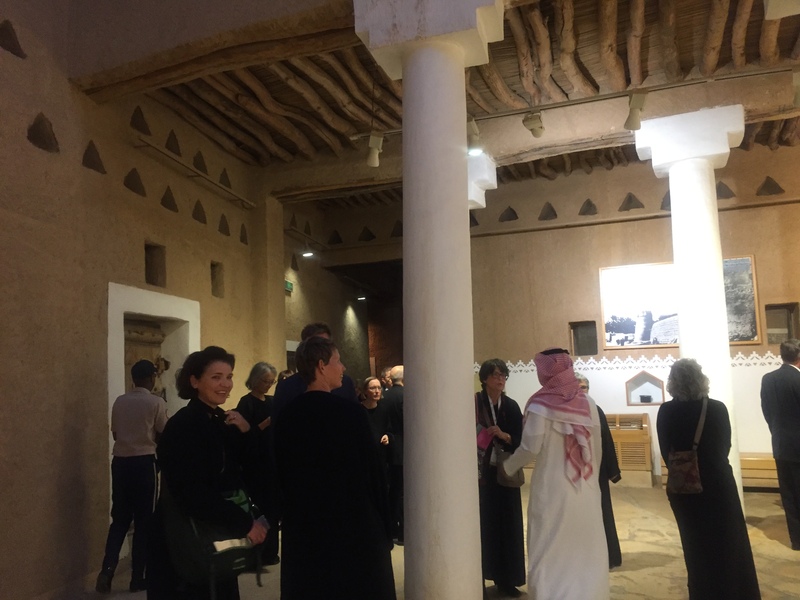 Following dinner, some participants visited the National Museum of Saudi Arabia, while others ventured to one of the popular souks. 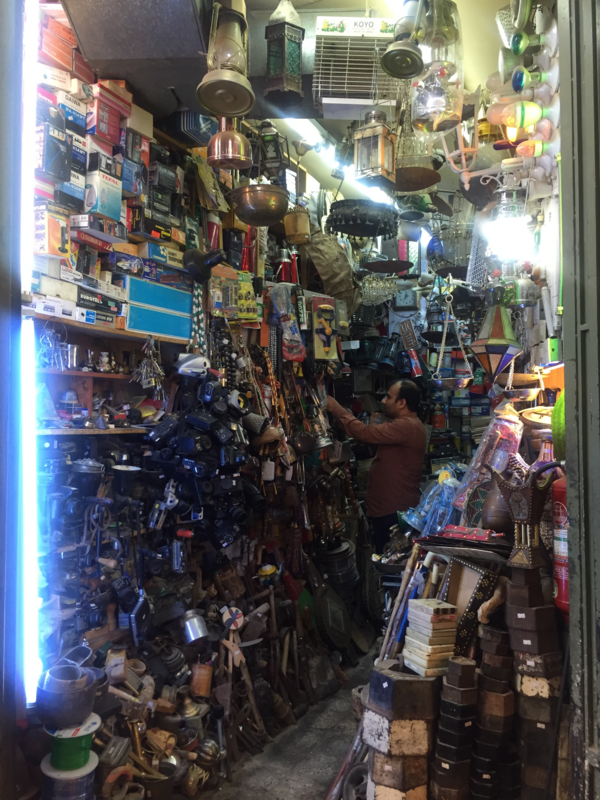 A souk is an outdoor market with shops that sell fragrances, antique rugs, traditional clothing, jewelry, souvenirs, and more. Thirty Saudi riyals bought my mother a beautiful golden candle holder for her living room. Perhaps the most inspiring part of visiting the souks was watching what seemed like the entire city shut down for prayer time and walk together to a nearby mosque. The unity and dedication to spirituality and culture in the kingdom is compelling. It is essential to be exposed to these types of experiences to ensure that the work we do for children reflects multicultural and anti-bias practice. 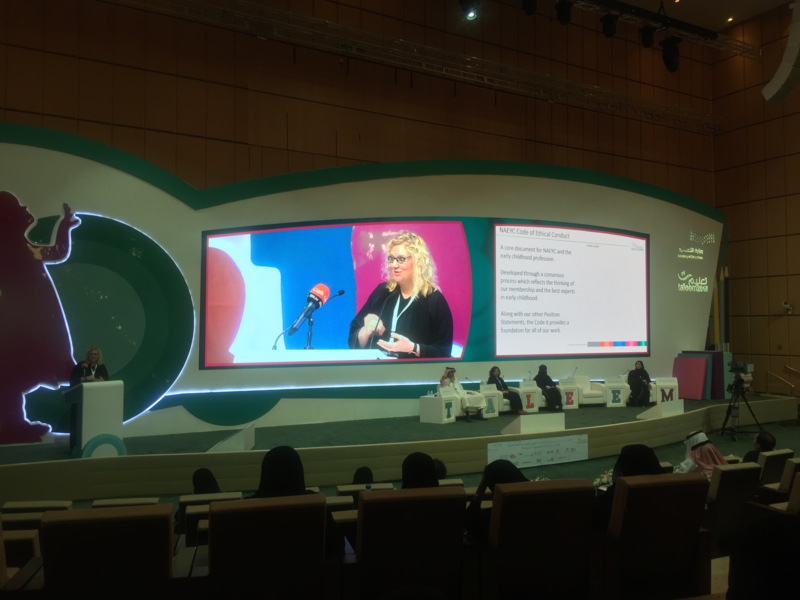 In her keynote presentation on system building in high-quality early learning, Rhian Evans Allvin, NAEYC’s CEO, asserted that “we all have cultural uniqueness and distinctions, but what binds us is our mutual goals! We share a common responsibility to all young children.” This idea is precisely what we witnessed in the five days we spent in Saudi Arabia. We traveled with our abayas in hand and core values in mind, respecting diversity and recognizing that children are best understood in the context of culture, community, and society. Thus, comradery was built between US and international friends in their shared commitment to providing high-quality early learning to all young children. 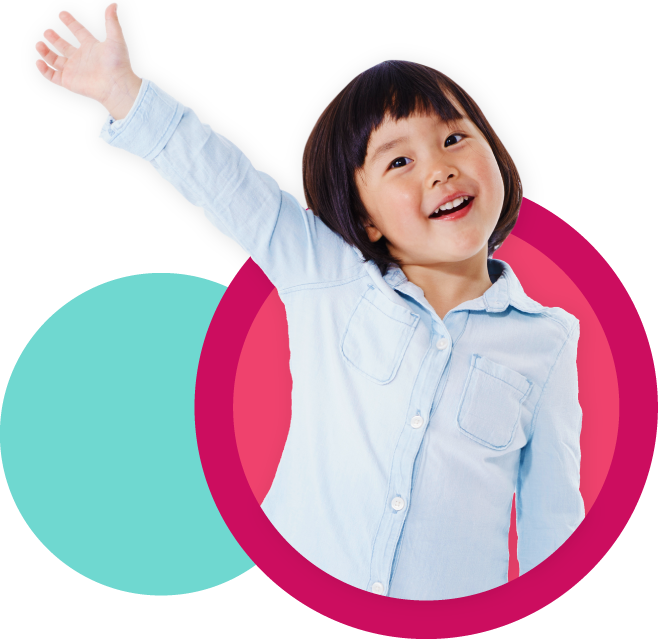 For more information about NAEYC’s international efforts, please visit our Global Engagement webpage or contact us at global@naeyc.org. Jerilyn Gamble is the Marketing Manager at NAEYC.